The Darien girls tennis team celebrates its second straight FCIAC championship by posing for a trophy shot after defeating Staples 4-3 last Tuesday at Wilton High School. 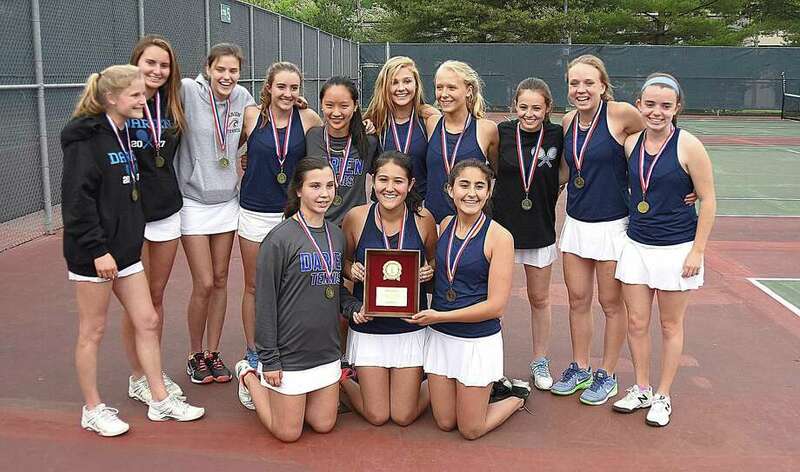 DARIEN—For the second year in a row, a promising state tournament run for Darien girls tennis has been cut short. Days after winning the FCIAC championship, fourth-ranked Darien defeated Southington in the first round of the Class L tournament. After the event however, the school self-reported the use of a potentially ineligible player to the CIAC—Connecticut athletic’s governing body. It was deemed that indeed, a Darien player had played in a match outside of CIAC play and the Blue Wave victory was forfeited. A press release issued by the CIAC highlighted the by-laws regarding the use of an illegal player. Last season, as the No. 1 seed, Darien went through virtually the same situation after its opening match with Wilton. With a conference title already in hand, and state championship aspirations dashed, Manfredonia offered kind words to the parents of the team.